The brain is an amazing machine, but it has its flaws. Why, for example, do we so often choose short-term gratification over long-term stability? 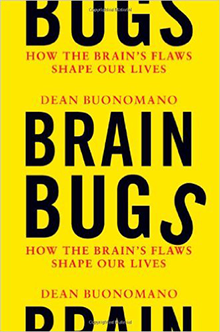 In Brain Bugs, Dean Buonomano, a professor of neurobiology and psychology at UCLA, argues that such flaws are the result of a still-evolving brain confronted with the rapidly changing complexities of the modern world. Our brains still have “bugs” inherited from our ancestors—processes and reactions that may have served humanity well in a different age, but no longer apply today. Understanding these brain bugs and where they come from can help us escape their influence and make smarter choices.